During World War II, Adolf Hitler showered the grand mufti of Jerusalem, Haj Amin al-Husseini (the titular leader of the Palestinians) with gifts, wealth and a Berlin villa. Why? Because he broadcast Nazi propaganda to the Middle East, recruited European Muslims for the SS, exulted the Holocaust and after the war went on to represent the Palestinians in the Arab League. By any standard, he was a war criminal, but today he is a hero among many Palestinians. As columnist Richard Cohen argues, ?His exterminationist anti-Semitism was considered neither overly repugnant nor all that exceptional. The Arab world is saturated by Jew-hatred.? This sentiment remains a strong part of current Arab nationalism. A current and most relevant example is Sheikh Yusuf al-Qaradawi, an esteemed religious leader and Muslim Brotherhood figure, whose anti-Semitic credentials are impeccable! For example, he has declared that Hitler was sent by Allah as ?divine punishment of the Jews.? His al-Jazeera program is one of the TV network?s most popular. Ideas, sentiments and prejudices like this are dangerous in the Middle East. Some are saying that the Muslim Brotherhood?s anti-Semitism is not that pronounced, nor really anything to worry about. As Cohen observes, ?there are no Jews in Arab lands, they were kicked out after Israel was established in 1948. Nowhere in the Middle East is peace with Israel popular. Nowhere in the Middle East is anti-Semitism considered aberrant or weird. It is inconceivable to me that Arab politicians will not attempt to harness both sentiments, combining nationalism with anti-Semitism, a combustible and unstable compound. History instructs us about what follows.? When it comes to the Arab world, it almost seems as if the world community has granted an exception to the standards expected of the rest of the world. Genesis 12:3 is still a powerful reminder of God?s standard when it comes to the Jews. God told Abram that He ?would bless those who bless you and curse those who curse.? Therefore, anyone who disrespected and treated Abraham (and his descendants) and his faith lightly would thus be removed from the place of blessing. Consequently, Abraham would be the channel of blessing for the whole world. No one would find divine blessing apart from the blessings given through Abraham and his seed. The Apostle Paul, of course, picks up on this passage and sees this blessing coming through Jesus Christ, the Savior of the World. That divine blessing is ultimately the blessing of justification by faith. 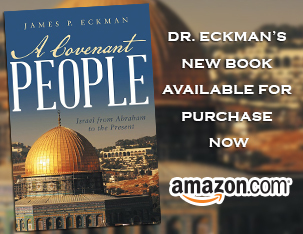 The Jewish people remain a strategic part of God?s program. Daniel 9 through 12 make it crystal clear that God still has a plan for the Jewish people as He fulfills His covenant promises made to the patriarchs. The world is foolish if it believes God will ignore anti-Semitism. He will not! See Cohen?s essay in the Washington Post (28 February 2011).